NORFOLK--Mrs. Celiney Alexander Decker, 69, of 1158 Larchmont Crescent, who as a 15-year-old immigrant bride from Lebanon survived the sinking of the passenger liner Titanic in 1912, died Thursday at 5:30 P.M. in a hospital. Only one other Titanic survivor now lives in Norfolk. She is Mrs. Sam Aks, who lived within several blocks of Mrs. Decker for 38 years before they met in 1951. They had been on the same deck of he liner and in nearby cabins. 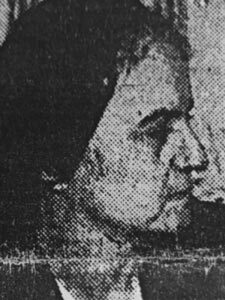 She was the widow of Elias M. Decker, her second husband, who died in 1949. She lived in Norfolk 54 years. She was a daughter of Mr. and Mrs. George Alexander of Lebanon. Newlywed to Anthony Yesbak (sic), she had started a journey to this country with 18 friends and relatives from Lebanon when disaster struck. Her husband had been in the United States before and had become part-owner of a business in Wilkes-Barre, PA. He was lost and so was a nephew. Her lifeboat was only a short distance away from the Titanic when the end came to the ship. She was picked up by the Cunard liner Carpathia , which sped to the scene from 58 miles away. She remembered little of the Carpathia except "consoling and being consoled." She was a member of Blessed Sacrament Catholic Church and Block Rosary. Surviving are three daughters, Mrs. Louise Miller of Los Angeles and Mrs. Lillian Cornette and Mrs. Marguerite Nichols of Virginia Beach; six sons, Police Capt. Frank E. Decker, George M. Decker, Melvin D. Decker, and Alfred M. Decker of Norfolk, Charles F. Decker of Washington, and Robert R. Decker of Chesapeake; a sister, Mrs. Emeline Decker of Wilkes-Barre, PA.; three brothers, Shibble Alexander and Zouk Alexander of Lebanon and Zahi Alexander of Colombia, South America; and 21 grandchildren. The body will be taken from H. D. Oliver Funeral Apartments to Blessed Sacrament Chapel on Colley Avenue for a funeral service Saturday at 11 A.M. Burial will be in St. Mary's Cemetery. The Rosary will be recited in the funeral apartments tonight at 8:30.